Antiquities minister Mamdouh Eldamaty announced on Monday that the first examinations carried out by himself and British archeologist Nicholas Reeves in Luxor on Tutankhamun's tomb have revealed that the tomb's northern and western walls both hide chambers. There are scratching and markings on both walls like those found on the entrance gate of Tutankhamun's tomb when it was discovered in 1922, Eldamaty explained. "This indicates that the western and northern walls of Tutankhamun's tomb could hide two burial chambers," Eldamaty told Ahram Online. Nicholas Reeves said their investigations showed the tomb's ceiling extends behind the northern and western walls. He is now almost convinced his theory suggesting the existence of two undiscovered chambers is correct. "After our first examination of the walls we can do nothing more until we receive the all-clear from the radar device to confirm the our findings," Reeves told Ahram Online. Eldamaty has promised that on 4 November, the same day Tutankhamun's tomb was discovered, the radar results of scans on the two walls will be announced. Reeves believes the northern wall painting in Tutankhamun's tomb depicts the boy king completing a death ritual for queen Nefertiti. Mainstream scholarship says the painting shows king Ay doing the ritual for Tutankhamun. 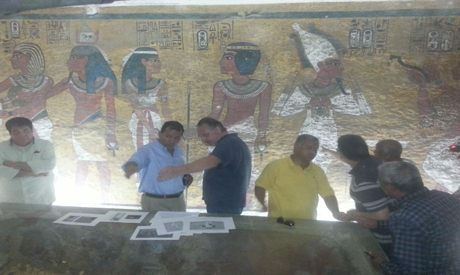 Now studies of wall paintings in the tombs of Ay and Tutankhamun will test Reeves' theory. In August Reeves published a paper suggesting the western and northern painted walls of Tutankhamun's tomb have secret passageways leading to two chambers, one of them containing the remains of Nefertiti — queen of Egypt and the chief consort and wife of the monotheistic King Akhenaten, Tutankhamun's father. At the footsteps of Tutankhamun's tomb Reeves enthusiastically told Ahram Online that although they must wait for the radar results, they were able to look for other features not present in the digital photos he had been using. The photos were taken by art organization Factume in order to reconstruct a replica tomb of Tutankhamun. They found several such features; the extended ceiling, the traces of two doorways and royal stamps. "I am pretty sure that a very important discovery is to be made soon inside Tutankahmn's tomb," Reeves confirmed. Eldamaty told Ahram Online he now thinks it very likely there are hidden chambers, but disagrees with Reeves when he says they could house the crypt of queen Nefertiti. Eldamaty believes she will have been buried in Tel Al-Amaran, the ancient capital of Akhenaten's kingdom. "I am very enthusiastic about this work and I'm sure something is going to be discovered behind those two controversial walls," Eldamaty said. They are dead! Those are dead guys! Never got to see the traveling exhibition of the boy King's artifacts, but have always been fascinated by the discovery of "wonderful things" found in his tomb. I'll be checking back on a regular basis for any updates on the "discovery". Fingers crossed that more "wonderful things" are found.